Google has bought a biotech company that has developed a spoon designed to make life easier for people with diseases such as Parkinson's. It is part of its ambitious foray into health technology, spurred in part by the personal interest of co-founder Sergey Brin. Last year, Google became the main investor in Calico, a firm dedicated to developing medicines to extend life. Latest acquisition Lift Labs will join Google's research division Google X. 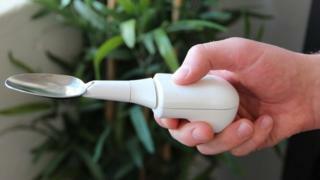 The spoon developed by Lift Labs is equipped with sensors that detect tremors and cancels them out by as much as 70%, according to the firm. The technology it uses is similar to image stabilisation features in cameras that compensate for shaky hands when taking a photo. The firms announced the deal on the search giant's social network Google+ but did not reveal the financial terms. "Today we're welcoming the Lift Labs team into Google X. Their tremor-cancelling device could improve quality of life for millions of people," said Google. For its part, Lift Labs wrote: "Google will enable us to reach even more people living with Parkinson's or essential tremor who could benefit from using tremor-cancelling devices every day." Google is gradually increasing its health portfolio. In January it unveiled its smart contact lenses that measure glucose levels in tears to help monitor people with conditions such as diabetes. And in July it announced an ambitious science project - Basline Study - to collect anonymous genetic and molecular information to create a picture of what a healthy human should be like. For co-founder Sergey Brin the move into healthcare is a personal one. His mother developed Parkinson's and, after gene testing, he found that he has a higher than average chance of getting the disease. Meanwhile his fellow co-founder Larry Page, who suffers from a rare vocal cords problem, is interested in how big data can help solve some of the world's most problematic diseases. He has made public his hope that people would overcome privacy fears to make their medical records available to researchers. Google's semi-secret research facility Google X was set up to work on cutting-edge technology. Other projects include Google's driverless car, balloons to deliver broadband and Google Glass.